Ahhh, Mother’s Day. Is it just me or does anyone else sweat thinking about what to give all the mamas in their life? There’s absolutely nothing I can buy that will truly show my favorite moms how much they mean to me. 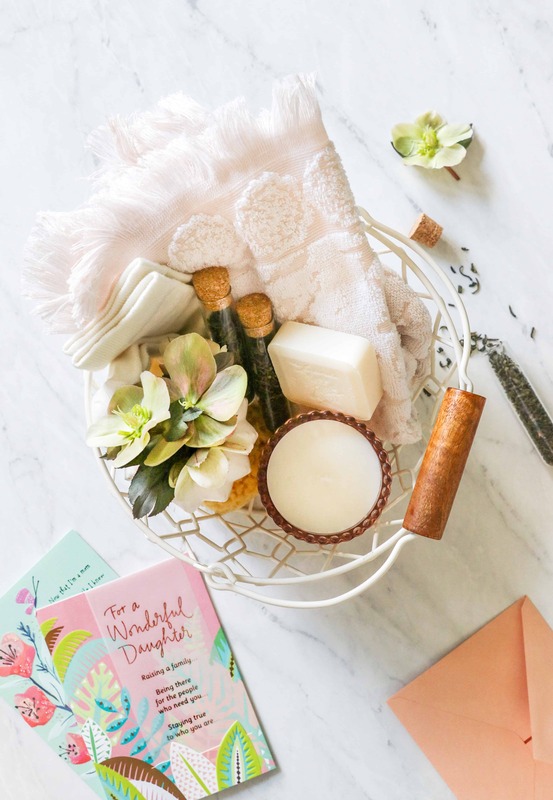 But this handpicked self-care gift basket comes darn close. 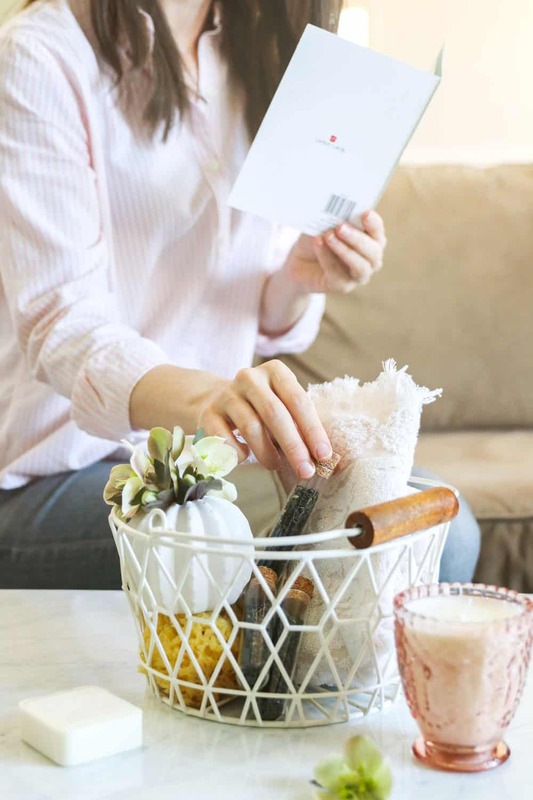 With some comfy socks, soothing tea, a deliciously-scented candle and a thoughtful note (inside a gorgeous American Greetings card, no less), why not celebrate mom by giving her time and space for a little self-care? I’m obsessed with gift baskets. They’re super easy to put together and 100% customizable for everyone on your list. Plus, they work for every budget—simply choose items in your price range or swap out items entirely for more affordable options. The sky’s the limit. To make your gift basket feel as special as possible, I think it’s super important to keep the recipient in mind when picking out your items. And always include a handwritten note. While gifts go a long way toward showing someone you care, putting your feelings into words takes things that much further. When I first started dating my husband, I thought he was weird for always (always) buying a greeting card. No matter the occasion, he’d make us swing by the store at the last minute to pick out the perfect card—even if it meant being late. As the years have gone by, I’ve found myself hopping on the card bandwagon without even thinking about it. And nowadays? It’s not a special occasion without a card and a note. 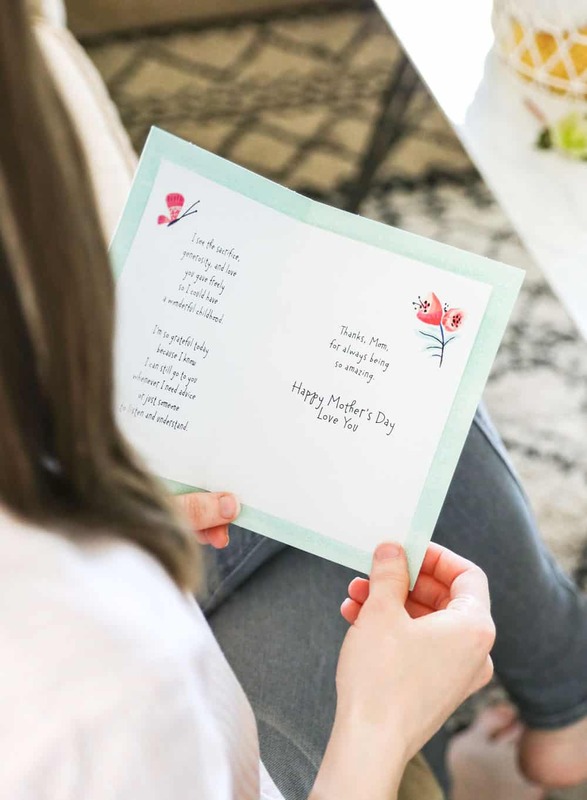 Whether you’re celebrating a friend who just had a baby, your mother-in-law, or your own mom, American Greetings makes it so easy to find the perfect card for mamas of all kinds. Since Target carries a huge selection of American Greetings Mother’s Day cards, I swung by my local store one evening after work. The card section in my store is right across from the beauty aisle, which made it easy to pick up everything I needed for my gift baskets in one fell swoop. One of the things I love about American Greetings is that they’ve seriously thought of everyone. I settled on a couple of gorgeous cards for two important, but hard-to-shop-for, women in my life: a friend who recently lost her mother and my own mom. Out of all the options, I picked these two cards because they’re cheerful and fun but they also express what I sometimes can’t find the words to say. They also leave plenty of room inside for me to add my own note—a must when it comes to greeting cards. 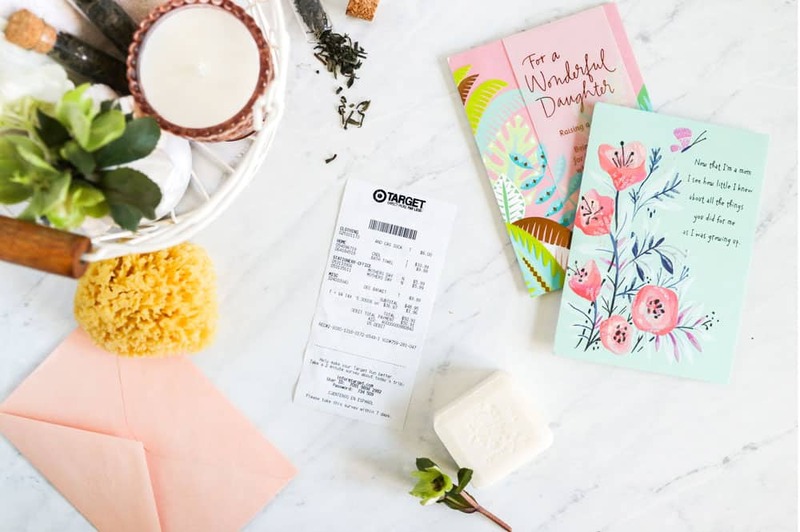 After covering all my greeting card bases, I did a quick loop through Target’s beauty, home and clothing sections looking for self-care items I thought my ladies would love. I spotted some gorgeous candles from a mile away at my Target and immediately put a few in my basket. I love that they come in a vintage-looking glass jar and a bunch of different colors to boot. Plus, they smell amazing and they burn really slowly so they’ll last a long time. After a long day, there’s nothing like coming home from work, getting in your PJs, and putting on a pair of comfy socks. I fell in love with the bright selection of women’s socks at Target, so I bought a couple 3-packs and divvy-ed them up among my gift baskets—this made them super affordable. I’m a little obsessed with giving and getting tea, so I always make sure to include some in my gift baskets. You can find loose tea in the bulk bins at your local health food store. Simply take home a few different types of tea and package it up in small spice containers, paper packages or test tubes from the craft store. Nothing says self-care like artisan soap and a gorgeous natural loofah. Either pick a sampler pack of soap and split it up or purchase individual bars in various colors and scents. 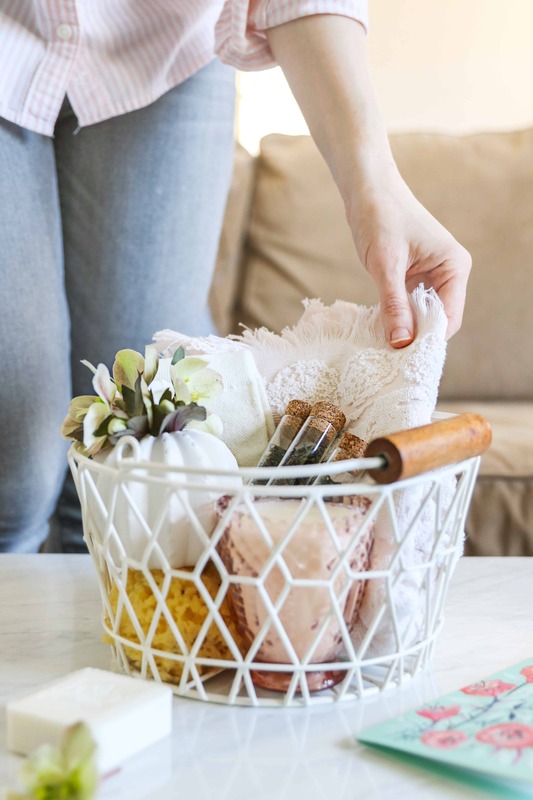 Then, pair it with a natural loofah or a soft soap mitt to make exfoliating a breeze. Rather than gifting a huge bouquet of flowers, I like to tuck freshly picked blooms in a small bud vase. Not only is it easier to transport but it’s perfect for displaying on a coffee table, desk or kitchen counter. Although not everyone can appreciate a pretty towel, my mom loves them. I tossed a gorgeous towel in my basket that my mom can use after treating herself to a spa day or as decoration in the powder room.